Propagating Geraniums (pelargoniums) from cuttings is easy and so fun. Quickly and easily get new geraniums from you existing plants and have tons for summer baskets, containers and the garden! Propagating geraniums has got to be one of the easiest to do from cuttings. Actually these plants are pelargoniums not true geraniums (click here to visit my How to Grow Hardy Geraniums post) but this is what most of us in the US know pelargoniums by. Though they are a perennial in zones 10-11 many grow them as annuals. But you can overwinter them in other zones. A link to how that can be done is at the end of this post. I enjoy starting geraniums from seed especially to get varieties you cannot find in garden centers but I also have a ton of fun starting more plants from cuttings to get clones of the parent plant. Planting geraniums in a mass of color is a great way to pack a punch. Grouping a certain color also can attract hummingbirds flying over and other pollinators. 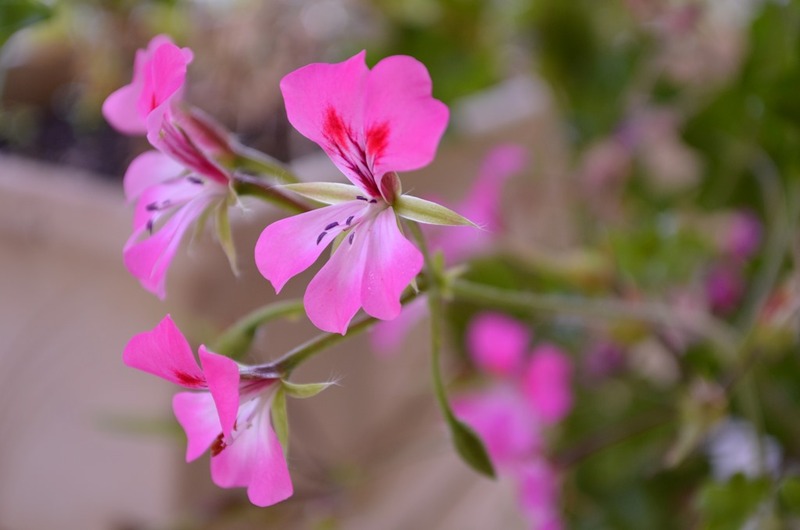 Zonal geraniums start quite easily from cuttings, making them a great one for beginners to get a taste of success in propagating from cuttings. The benefit of cloning is you get the exact same plant as the parent where as with seeds you may have saved you are not quite certain. The plant may have cross pollinated with another and you get a surprise (which can be fun too). Start with a nice, healthy plant. Take a cutting from a fresh, green branch just below a leaf node. Cut with something clean and very sharp, like sharp pruners, razor or xacto knife. It is important that you take the cutting from a new, green branch. Old crusty branch below….not what you want. I have my pots ready to roll. These have all been washed in hot soapy water with a touch of bleach, then rinsed well and air dried. Fill the pots with a 50/50 mix of potting soil and perlite. This makes a great draining medium for rooting. I have a great money saving DIY potting soil mix I create for most of my containers. With your pruners take a cutting about 4 to 5 inches long and leave two healthy leaves on them. When you put the stem into the pot make sure two leaf nodes are covered by the soil mix. Water well and press the soil firmly around the cutting. Rooting hormone or cloning gel is not needed with zonal geraniums. They do just fine without. Keep your cuttings at a moderate temperature and in bright light. I have mine in my greenhouse but you can put them under lights in the house as well. (update) Some say that putting them under a dome or cover will encourage fungus. I had my first experience just recently with that. These dome lids (in the photo) have good venting so I have not usually had trouble. The last batch of cuttings I just tried I put in a less ventilated box and they did get fungus and shriveled up. So be very careful, you can just set them out with no top and keep them misted from time to time during the day. Carefully pop these out of the small pots and pot them up into larger pots using a good potting medium. As they get larger harden them off and get them used to outdoor conditions. You can do this by setting them outside in larger intervals of time over a two week period. They should be in a sheltered spot with morning sun, afternoon shade or in light shade. Even if i am not familiar with your plants, i love your photos. I do love them, they are such a bright spot in the garden. Can they be held over through winter? If so how? I have a large beautiful bright red. Yes they can. I overwinter my geraniums all the time. Keep in a bright window and watch for spider mites or other pests. They do well if given enough light. You make it look very easy! The pink flower is very delicate and beautiful! Great post! I can not go by a geranium without thinking of my Mother bending over to rub the leaves and then smell her hand. Memories! And the geranium is one of my favorites. I love how certain flowers can bring back such fond memories. I had several colors of geraniums in my garden in the valley when I lived there, they were all given to me by several garden loving elderly ladies that lived in Linden back then. That was 20 years ago, but I knew where each and every cutting had come from and who gave it to me. It made my garden that much more special to me. Who could resist those colors? Gorgeous! I am looking to get white as well, such a great contrast for all the bright reds and pink. You are very thorough with your directions and pictures. That’s a great help. I just might even try this! You’ve done such a great job with clear photos showing exactly what to do here. I’ve been propagating a scented rose geranium. It gets so leggy in the house, but I love the smell. Have you tried the Martha Washington geraniums? I found some in a nursery a few years back. They are a little different and now I’m thinking if I can get my hands on one this year, I’ll bring it in and propagate some like you’ve done here. I love Martha Washington geraniums they are so gorgeous. I don’t have any right now, I accidentally left the one I had had for 10 years out in the cold instead of making sure it was protected during a particularly fierce winter. They do get leggy in the house but I would sheer mine back in the early Spring just before putting them outside for the summer and they would fill back in beautifully. I need to find a rose scented one, that would help get me through the winter. I have a pretty good window in my office it could do well in. Or my little Flower Patch cottage. I love doing this and making more for my garden and to give to others. It really is very easy and with our weather I can leave the new starts outside from day 1. Even easier! thank you …. your blog is like a little bit of sunshine. What a great post! I was just looking at my sad geraniums in my front yard and thinking I should add some to fill it out. So, I’m going to try my luck at your propagating and creating starts! Thanks so much for joining our Friday Friends Parade Linky party with this post! Just the info I needed to start new geraniums plants. problem, I have some nice geraniums, but they are at least three years old and have old crusty stems over a foot long with a little new growth on top. Pretty flowers, but ugly plants. How can I fix them to make them short and bushy with lots of green and flowers again? is it possible to cut the old growth and plant new starts with them? can I just cut the old growth short and have the plant grow new shoots, or will it kill them? Yes, you can cut them back and they will grow in thicker and pretty again. I many times cut them back quite short and store them in my basement over winter and drag them out in Spring. They will already have new growth by the time I drag them out and it is white because of the lack of light. I then keep them in my greenhouse to let them grow more and green up in a protected environment. We can have contrary Springs where it gets below freezing many nights. Now it’s time to give them a heavy duty hair cut! 1. Just were is the place they should be cut at? or does it not really matter? Since their are no leaves in this area, the only distinguishable parts are the old nodes that can still be seen. 2. Can the old growth that will be cut off be used to start new plants? the new growth on the ends is very short, 1-2 inches. Thanks so much for efforts in teach all of us that don’t know. You can try to root the old growth and see what happens, experimenting can be fun and surprising. I cut mine back to about 4 inches from the soil sometimes shorter. You see a new flush of growth very soon. It has now been a month from trimming back the geraniums. Just like you said, new growth is popping out on those cut back old crusty stalks,. I tried to make new starts with that old growth that was cut off, and today I re-potted them. One half of them grew and the other half rotted, Better than nothing! A couple of them were cuttings from new growth, they really took off and had a root ball the size of a base ball. They look excellent. After all is done, I should end up with about 50 or so starts from the original 12 that I started with. thanks so much, it has been exciting for a first timer! Wow, thanks for sharing! Taking cuttings and making new plants is addicting and oh so satisfying. Good to know that even 50% from the old crusty cuttings took. That is better than I thought. Congratulations. It has now been 2-3 months after making the cutting starts from the 12 atrocious and horrible plants. The original 12 plants look so much better after being cut way back! It seemed I would kill them and I left a little more than I should have, but it’s incredible the new vibrant growth and blooms. But even more incredible are the new starts. As for those from the old crusty starts, only about 25-30% made it, but with the new stem starts, almost everyone grew, and grew much more vigorously and vivaciously. Three to four times better than the old crusty ones. In the end, We ended up with 61 new plants ready to go out this week and 12 old plants that are absolutely beautiful again. Plenty to share! Thanks so much for your insights and expertise on helping others. Woo hoo, thank you for sharing. Propagating can become addictive but what fun! Pamela, what can I do to prevent my daffodils, gladiolus, foxgloves and similar flowers from falling over once the blooms get on them?